Gospel, Barnabas: Included among the apostles, although like Paul he was not of the Twelve. 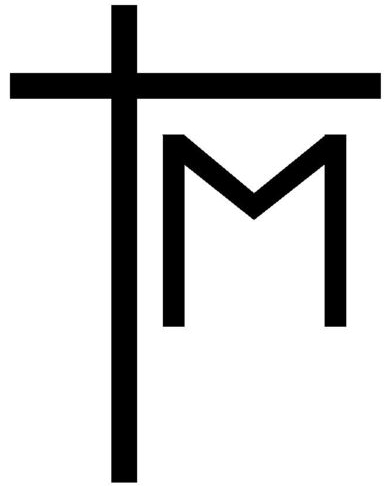 Tradition says he was especially successful as a preacher, hence the Gospel in the symbol. All-Seeing Eye: The all-seeing eye of God looks out from the triangle of the Trinity. It is found in some English and Greek churches. Fallen idol, St. Cornelius: A Pope of Rome, 251-3 A.D. During his short episcopate he was harassed by religious controversies, by the appearance of a rival pope. Martyred 258 A.D. Prayer, St. Mary, wife of Cleophas (Cleopas): The mother of the apostle, James the Less. She was one of the three Marys who stood at the foot of the cross on Calvary. First Century. Nikki Johnson provided the alternate spelling. Sheet music, St. Ambrose: This famous Bishop of Milan, one of the four Doctors of the Western Church, was a great lover of music. He added to the richness of sacred services of the Church with it, and introduced the antiphonal chants bearing his name today. 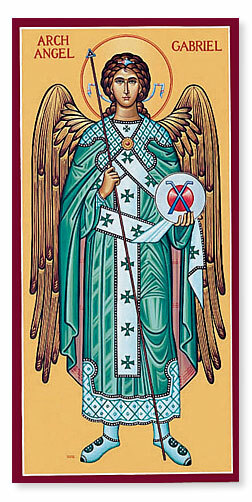 Died 397 A.D.
Spoon, St. Raphael: The archangel who is the guardian angel of all humanity. He is called the "Healer of God" and is identified with the angel of the pool at Bethesda. Ship, St. Thaddaeus: Also called Jude or Judas (not Iscariot). Thought by some to be the brother of James the Less and author of the epistle bearing his name. First Century. Keys, Peter: The crossed keys recall Peter's confession and our Lord's gift to him of the keys of the kingdom. See Matt. 16:18,19. Scroll, St. Theodore of Canterbury: A Greek monk nominated by Pope Vitalian as Archbishop of Canterbury. He was the last foreign missionary to occupy the metropolitan see. Died 690 A.D. Pen and sword, St. Alban: He was a pagan who sheltered a persecuted priest, and was converted. He helped the priest escape, whereupon the fury of the pagans turned on Alban. He was beheaded in the city which now bears his name. Martyred about 303 A.D.
Censer: Symbol of prayer. As incense smoke wafts upward, so prayer ascends before God (Revelation 8:4 and Psalm 141:2). 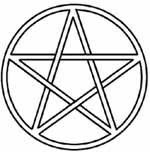 Circle: Used in many religious symbols, the circle is without beginning and without end, so it represents eternity. Scale, St. Michael: One of the archangels, St. Michael is regarded traditionally as guardian of the Church and its members against the evil one. It is he who is supposed to weigh the souls of men at the Last Day. St. George: St. George is the patron saint of England and venerated as the model of knighthood and protector of women. Also the patron of soldiers since he was long a military man engaged in warfare with the pagans. Martyred 303 A.D.
Upside down L with dots: Upside down L with dots - Masonic symbol, Tubal Cane (two ball cane). Arrows, St. Giles of Provence: Reputed to be a Greek cripple who refused the be cured of an accidental lameness in order that he might more completely mortify his pride. Lived as a hermit in a cave. Patron saint of cripples and beggars. Died 712 A.D. Infant on Bible, St. Anthony of Padua: A faithful and eloquent preacher against doctrinal errors and wickedness, he is usually referred to as the "hammer of heretics." A follower of St. Francis, he preached in France, Italy, and Sicily until his death in Padua. Died 1231 A.D.
Elijah's Chariot of Fire: The prophet Elijah ascended to heaven on a chariot of fire, watched by Elisha (2 Kings 2:11). Dagger, St. Edward the Martyr: King of England at the age of thirteen. He was stabbed to death by his stepmother, who wanted the throne for her own son Ethelred. Martyred 979 A.D.
Chalice, St. Oswald: First of the English Royal Saints. As King of Northumbria he diligently sought the complete evangelization of his country, and died fighting against a champion of paganism. Died 642 A.D.
Ship, Jude: This apostle traveled far on missionary journeys, hence the ship. Urn, St. Bede: The Venerable Bede entered a monastery at the age of seven years for his education and remained there for the rest of his life. He spent his time reading, praying, teaching, and was a voluminous writer. Died 735 A.D.
Pillars, St. Athanasius: Athanasius was Bishop of Alexandria and an unusual student of Holy Scriptures. He was an authority on the ecclesiastical and canon laws of the Church and exerted a powerful influence in the Church. Died 373 A.D.
Bible, St. Denis (Dionysius) of Paris: A Roman missionary who penetrated far into Gaul and became the first bishop at Paris. Venerated as patron saint of France. Martyred 272 A.D.
IHS heart, St. Ignatius: Ignatius was Bishop of Antioch in Syria. When asked by the emperor for a sacrifice to heathen gods, Ignatius refused. He was condemned and thrown to the wild beasts. Martyred 107 A.D.
Taoism Symbolizes Taoism (see the glossary). Sikhism Symbolizes Sikhism (see the glossary). Chalice, John: Early writers state that John once drank from a poisoned chalice and was unharmed. Souls of the Righteous: Symbolizes a sentence in the Book of Wisdom, "The souls of the righteous are in the hand of God." Shinto Symbolizes the Shinto religion (see the glossary). Sword and Bible, St. Boniface: This saint, a Benedictine monk, carried the Gospel to Germany and founded the Abbey of Fulda which was the center of German missionary activity. Martyred 755 A.D.
Angel, female 2: Female angel. Angel, female 1: Female angel. Greek ruins, St. Titus: A convert of St. Paul, and mentioned in the Pauline epistles as his brother and co-partner in his labours. Reputedly the first Bishop of Crete. First Century. Fire, St. Uriel: One of the archangels, his name means "God is my light." He is considered the interpreter of prophecy. St. Augustine: Known as the "Apostle of the English", Augustine and forty monks carried the Gospel to England. Received by the pagan king, Ethelbert, who soon was baptized with many others. Later Augustine was made Bishop. Died 604 A.D. Coins, St. Nicholas: Bishop of Myra. Tradition says that St. Nicholas went secretly to the house of a destitute nobleman three nights in succession and threw a purse of gold in the window. Patron saint of children. Died about 326 A.D.
Monk, St. Ansgarius (Anskar): A missionary of the Faith to the Norsemen of Scandinavia. Long he labored amidst great discouragements and hostile tribes. Finally his self-denial and love for others made an impression and the savage people became Christian. Died 865 A.D.
Open Bible: Symbolizes the Word of God. Bread, Philip: A cross and two loaves of bread, because of Philip's remark when Jesus fed the multitude. John 6:7. Knives, Bartholomew: Bartholomew is said to have been flayed alive, hence he is usually represented by three flaying knives. Iron bed, St. Lawrence: A deacon at Rome under Sixtus II. Three days after the latter was put to death, Lawrence was tortured on an iron bed (or roasting rack according to Hilarie C) over a fire. Martyred 258 A.D.
Scissors, St. Agatha: Born in a noble Sicilian family, Agatha was famous for her beauty and gentleness. She refused to give up her Christian faith at the command of the governor, and was unspeakably tortured. She is the patroness of bell-founders. Died 251 A.D.
Bible, St. Martin: One day Martin saw a shivering beggar and shared his own cloak with the stranger. Later he entered the Church and while Bishop of Tours he converted his whole area to Christianity. Died 401 A.D.
Scepter, St. Gregory: As Pope, 590-604 A.D., Gregory reformed the services of the Church and arranged the music of the chants. One of the truly great popes. Died 604 A.D.
Purses, Matthew: Symbolized by three purses, referring to his original calling as a tax collector. Bible with Ax, Matthias: Chosen to take the place of Judas, he is symbolized by an open Bible and double bladed battle-axe. He is said to have been beheaded after his missionary work. Crown, St. Louis: King of France, a brave warrior, very considerate to his people, especially the poor. In private life, more austere and prayerful than many a religious. Leader of two crusades. Died 1270 A.D. Burning Torch: Symbolizes witnessing for Christ. "Let your light so shine." (Matthew 5:16). Jainism Symbolizes Jainism (see the glossary). Triquetra: Early symbol of the Holy Trinity. The three equal arcs express eternity in their continuous form, indivisibility in their interweaving, and their center is a triangle, ancient Trinity symbol. Ax and crown, St. Olaf: The son of the King of Norway. As a youth he lived a wild life. Accepted baptism and as king summoned missionaries from England to Christianize his country. Died 1030 A.D.
Circle and Triangle: Combines the symbol for eternity with the symbol for the Trinity. Spiked wheel, St. Katherine (Catherine) of Alexandria: Early converted to Christianity, she vanquished her pagan adversaries in a debate. This so enraged the Emperor that he ordered her put to death on a machine of spiked wheels. She was saved by a miracle but was later beheaded. Martyred 310 A.D.
Purse, St. Cyril of Jerusalem: Bishop of Jerusalem for many years. At one time was expelled because he sold ornaments of the church to provide food for the poor. Wrote instruction on Christian doctrine for catechumens which have been highly regarded ever since. Died 386 A.D.
Horn, St. Hubert: According to legend, Hubert was converted while hunting and immediately won over to a better life a band of brigands he met in the forest. Became Bishop of Liège. Died 727 A.D. Arrows, St. Edmund: At fifteen years of age Edmund became king of the East-Angles. He was very devout and religious. During a pagan invasion, Edmund refused to give up his Christian faith and was shot to death with arrows. Died 870 A.D. Mother and child, St. Elizabeth: The mother of John the Baptist. All that is known of her is given in the first chapter of Luke. First Century. Cannister, St. Mary Magdalen: This Mary was the sinning and repentant woman forgiven through the love of Jesus. Appropriately, she is the patron saint of penitent women. Died 68 A.D. Ax, St. Cyprian: A lawyer, converted to Christianity, who became the Bishop of Carthage. Wrote several important theological treatises, and became a pioneer of Christian literature writing. Martyred 258. A.D.
Bahai Symbolizes the Bahai faith (see the glossary). Islam Symbolizes Islam (see the glossary). Muslims use very few symbols, and in particular, they do not depict leaders and prophets. Candlestick: These suggest our Lord's words, "I am the light of the world," John 8:12. A pair of candlesticks represent His two-fold nature - human and divine. Hat, St. Roch (Rocco): A citizen of France who devoted his life to the service of the plague-stricken, especially those who were abandoned. Patron of hospitals and prisons. Died about 1318. A.D. Ladder Crossed with Reed and Sponge: A symbol of our Lord's crucifixion, since the sponge was used to provide him vinegar while on the cross. Stool, St. Mary of Bethany: The sister of Martha and Lazarus, who won commendation from Jesus because of her eagerness to sit at his feet and learn of him. First Century. Seamless Coat: One of the Passion symbols, referring to the garment of Jesus for which the soldiers at the foot of the cross cast lots. Easter Eggs: From the children's page, we know that there's no bunny distributing eggs in the Easter story. It's OK to celebrate spring, but remember the sacrifice of Jesus. Monastery, St. Gerald of Auriliae: Gerald lived a very holy life "in the world" at a time of great moral degeneracy. He lived according to a very strict rule and founded a monastery for Benedictines. Died 909 A.D.
Mountain, St. David: The patron saint of Wales, in which country he was born. He founded many monasteries, the most famous of which was in what is now St. Davids. His monks followed a very austere rule. Died about 588 A.D.
Marian Cross: Represents Mary at the foot of the cross. Alpha and Omega: The first and last letters of the Greek alphabet which signify that Jesus is the beginning and the end of all things. See Revelation 1:8. Equilateral Triangle: The three distinct angles combine to make one complete figure, symbolizing the Holy Trinity. 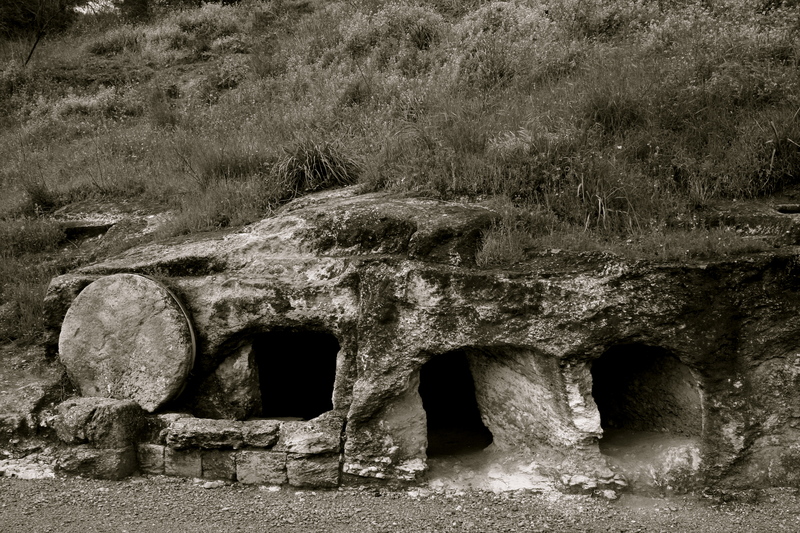 Empty tomb: The empty tomb. Mark 16. Three Intertwining Circles: These indicate the doctrine of the equality, unity, and coeternal nature of the three persons of the Trinity. Lighthouse, St. Christopher: Legend says that Offero (bearer) once carried the Christ child on his shoulders across a swollen stream, and so thereafter was known as Christopher (Christ-bearer). Patron saint of travel. Martyred about 250 A.D.
Carpenter's square and a spear, Thomas: A carpenter's square and a spear, because this apostle is said to have built a church with his own hands, in India. 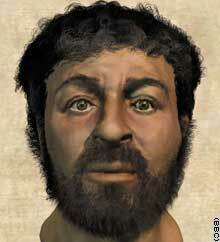 Later, he was persecuted there and was killed with a spear by a pagan priest. Indigenous Symbolizes indigenous (pagan, indian, aboriginal) religions (see the glossary). 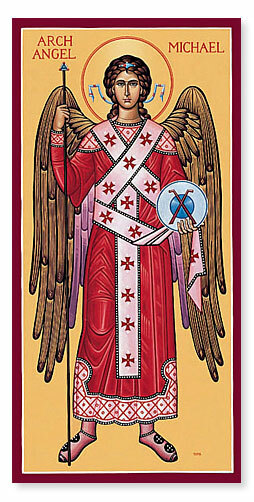 Archangel Gabriel: The archangel Gabriel. Anchor, St. Clement: Converted to the Christian faith by St. Paul. He became the Bishop of Rome, later he was martyred by being cast into the sea tied to an anchor. Martyred about 100 A.D. Saw, James (the lesser): Represented by a saw, since it is said his body was sawn asunder after a terrible martyrdom. Book, St. Bernard: Early joined the Cistercians and later founded the Abbey of Clairvaus. Bernard was the adviser of popes and kings and write profusely, especially on the love of God. Died 1153 A.D.
Bible, Paul: Referred to as the "Apostle to the Gentiles," but not one of the twelve apostles. Symbolized by an open Bible with the words "Spiritus Gladius" (sword of the Spirit), and behind the Bible the sword of the Spirit itself. Scroll, St. Asaph: Distinguished for learning and piety, and for his earnest preaching. He was appointed bishop in a newly formed see in North Wales, which later was named for him. Died about 595 A.D. Knives, St. Nathaniel: Nathaniel is the name used for Bartholomew in the Fourth Gospel. He was the one whom Philip brought to Jesus and whose open mindedness qualified him to receive additional revelations about his resurrected Lord. First Century. Buddhism Symbolizes Buddhism (see the glossary). St. Faith: This beautiful young woman was very strong in her Christian belief and remained steadfast to her name when ordered to sacrifice to Diana. Burned to death. Died 290 A.D.
Hinduism Symbolizes Hinduism (see the glossary). Coat and stones, St. Stephen: The Deacon and first Christian martyr, called by Luke "a man full of faith and of the Holy Ghost." Stoned to death in the First Century. Pen, St. Cyril of Alexandria: A native of Alexandria and patriarch of the city. 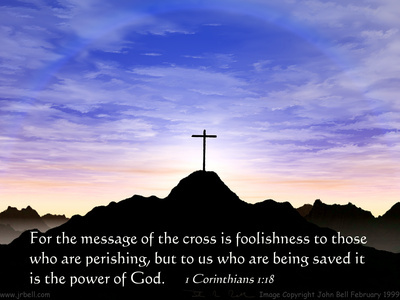 Gave much of his life to defense of the truth of Christ's divinity. Died 444 A.D. Winged Creature with a Man's Face, Matthew: The winged man represents Matthew because his Gospel narrative traces Jesus' human genealogy. Shield of the Trinity: The three curving sides, each exactly equal in length, carry the Latin words, "is not". The short straight bands have the word "is". The outer circles bear the words, "Father", "Son", "Holy Spirit", while the inner circle is "God". Pillar, St. Simeon: As a boy Simeon joined the community of St. John Stylites. For sixty nine years he lived on the top of pillars within the monastery, in the exercise of religious contemplation. Died about 597 A.D.
Harp, St. Cecilia: This Roman lady, educated as a Christian, converted her husband and shared martyrdom with him. Tradition says she wrote hymns and sang beautifully, so she is regarded as the patroness of music. Martyred about 200 A.D.
Confucianism Symbolizes Confucianism (see the glossary). Coat, St. John the Baptist: He baptized our Lord. "The man sent from God," the voice crying in the wilderness: "Prepare ye the way of the Lord," of whom Christ said, "among those that are born of women there is not a greater prophet." First Century. Aspergillum and cup, St. Martha: Martha was the hostess of our Lord in her home in Bethany. She is the patroness of housewives and books. Hilarie C reports that a medieval compilation, The Golden Legend, includes a story of Martha subduing a dragon with holy water sprinkled from an aspergillum. First Century. Club and stones, St. Timothy: Companion of Paul on his missionary journeys and referred to by Paul as "the beloved son in faith." Reputedly beaten and stoned to death for denouncing the worship of Diana. First Century. King, St. Charles (King Charles I): The only person formally canonized by the English Church since the Reformation. Known as Charles the Martyr, he was beheaded in London in 1649. Flame of the Holy Ghost: The Holy Ghost, part of the Trinity, is often represented as fire. Book, St. Chad: Abbot of the Priory of Lastingham. Noted for his religious life. Preached as a missionary through all the Northumbrian territory. His church is considered the origin of Lichfield Cathedral. Died 673 A.D.
Book, St. Anne: The mother of the Virgin Mary. From the Apocryphal Gospel records Anne has been honored, though nothing is known of her life. The book is a symbol of her careful instruction of Mary. First Century. Coat, St. Vincent: At the age of twenty, Vincent was already an ordained deacon. With a unswerving Christian faith he underwent horrible tortures under Diocletian. Martyred 304 A.D. Cornerstone: The cornerstone with abbreviations of the Greek words for Jesus Christ symbolizes Him who was declared to be the chief cornerstone. Ephesians 2:20. Pincers, Dunstan: The English-born Dunstan became abbot of Glastonbury. Legend says the devil went to Dunstan's cell to tempt him, whereupon Dunstan caught the devil by the nose with red hot pincers and caused him to flee. Died 988 A.D.
IHS, St. Monica: A Christian woman, she was married to a pagan husband whom she labored to convert, together with her eldest son, St. Augustine, who became the Bishop of Hippo. Died 387 A.D.
Cliff, St. Sylvanus: One of seven brothers who were persecuted as Christians under Marcus Aurelius. While his mother, St. Felicitas stood by exhorting him to remain faithful to Christ, he was cast from a cliff. Martyred Second Century. Pen, St. Hilary of Poitiers: Hillary was a student of rhetoric and philosophy and early became a convert to Christianity. He devoted his tongue and pen to fighting the Arian heresy and suffered banishment for his zeal. 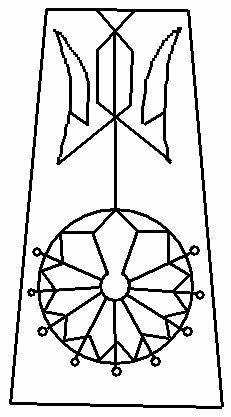 Died 368 A.D.
Nimbus (halo): The nimbus has come to be emblematic of sanctity and to denote a person recognized for unusual piety, such as, apostles, martyrs, and saints. Archangel Michael: The archangel Michael. Washing feet, St. Lioba: Of English birth, Lioba early was called to Germany by St. Boniface, who gave her a convent there. She was outstanding in piety, humility, and good works, and an honored friend of kings and queens. Died about 779 A.D.
Zoroastrianism: Symbolizes Zoroastrianism (see the glossary). Ship, St. Wilfrid (Wilfred): A devoted bishop who traveled widely on missionary labors, establishing, building, and strengthening churches throughout England. Died 709 A.D.
No More Coat Hangers: Symbolizes the pro-choice attitude that legal abortions are typically safer than privately performed, illegal abortions. Heart, St. Valentine: A priest who was active in assisting the martyrs in time of persecution. He was famous for the love and charity which he manifested. Martyred 269 A.D.
Bell: A bell calling to worship symbolizes the need of priority for the things of God over the secular. In general, the sounding forth of the Word. Lamp: A symbol for the Word of God. Rope: Recalls the rope used to bind our Lord when he was led away to the high priest, and thus symbolizes the betrayal and arrest. Ship: The Church sails unharmed through all perils. The word, "Nave" comes from the Latin word for "ship."